Rubber molding is a manufacturing process in which uncured rubber compounds are heated and cured within steel cavities i.e. molds to form usable rubber products of various geometric shapes and sizes. Typically, a vulcanizing agent such as sulfur is used to cure the rubber by forming disulfide cross-links throughout the rubber polymer matrix. The cured rubber then becomes more stable and gains improved mechanical properties. There are three primary types of rubber molding processes: injection molding, transfer molding, and compression molding. Each type of process is suitable for different applications depending on the geometric design of the rubber product as well as the rubber material choice, production rate, and other considerations. Additionally, rubber molding makes bonding of rubber to other components such as metal superior to adhesive use or other methods. Examples of molded rubber products include mechanical mounts, seals, pedal pads, hoses, bumpers, vibration isolators, and many conjoining components found between moving parts of machinery. Coi Rubber Products, Inc. is a custom manufacturer of molded rubber and plastic components with locations in US, China, and Mexico. Coi Rubber has over 28 years of experience in Engineering, Design, Compounding, Prototyping, and Production of molded rubber and plastics. We provide complete production, assembly, and engineering support to the Automotive, Industrial, Agriculture, Appliance, HVAC industries, and many more. Coi Rubber has the flexibility to efficiently and economically handle virtually any product size in both large and small volume runs. A wide variety of press equipment allows us to match your product to the best machine for the job. Molding rubber is our specialty with competitive prices, expertise service, and leveraging our knowledge and assets to add value to your supply chain. At Coi Rubber, we exceed expectations and aim to achieve perfection in manufacturing by meeting or exceeding your custom rubber molding requirements. 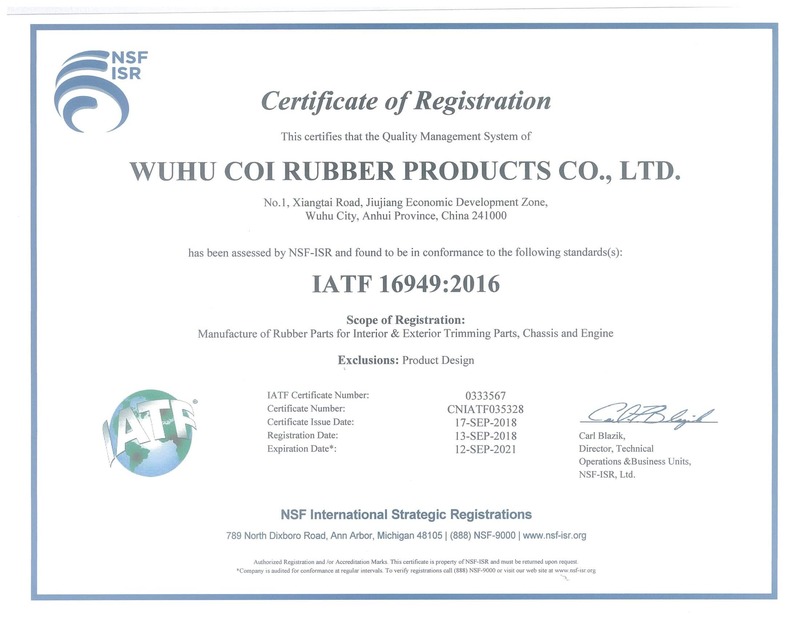 Coi Rubber Products is an IATF 16949:2016 certified and MBE manufacturing company based in the US. Quality and documentation is guaranteed with every order at Coi Rubber. Value-added services at Coi Rubber include FOB shipping to our Los Angeles headquarters and distribution center, US-based customer service and engineering support, and factory-direct prices from our American-owned and managed manufacturing facilities in China. Well-suited to bonding rubber to small, delicate metal parts or producing small parts from large multi-cavity molds.